Shady Oaks Shetlands is a delightful farm in the little town of Creswell, Oregon. Cookie and I share a snuggle. The pond is a great place for a lamb race! Check out Shady Oaks on Oregon Wool! 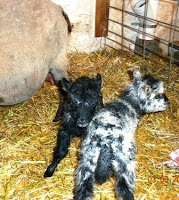 Lambs and more lambs! Oh MY! 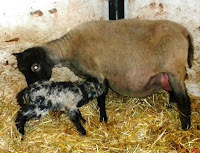 Lambing and kidding oh my! Hi, I'm 'Sheepmom'! Also known as Marybeth Bullington. Shetland sheep have been my companions for about 13 years now. Their bright eyes and soft fleeces still amaze and delight me. My greatest joy is sharing these little characters with other shepherds. I have loved and worked with animals all my life. I admit to being a research junkie about nutrition,care and support therapy for my flock. This intense interest in the well-being of the Shady Oaks Gang led to the moniker of "Sheepmom" from treasured friends and fellow shepherds. I am a spinner, a knitter and a total fleece addict. It's not at all uncommon for me to be lost in the fleece room purring over bags of multicolored wool. If you love sheep drop me an e-mail. Sheep are my passion and fleece is the frosting on the cake! 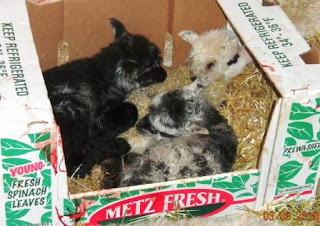 is the three little lambs that arrived on Monday morning in an orderly manner. No scrambling to get out all at once; a nice gentlemanly entrance into the world. Yes indeed folks Pepsi FINALLY decided to get with the program and stop carrying the lads around with her. Through the night on Sunday we visited periodically at which point she would sigh deeply, roll a little.......and bring up yet another cud! At last about 6 a.m. she began to excavate. She dug, and pondered, and dug some more. When two little feet appeared (pointing in the right direction and belonging to the same lamb whose nose followed closely, the Shepherdess was quite relieved. After meet and greet was well started I milked Pepsi out and gave the lad his first meal in a bottle. He downed two ounces in nuthin' flat. Two more boys followed with a comfortable interval between. Each got their first meal of colostrum to give them a good start in life just in case they had navigational challenges in locating the lunch counter. All was going well until Pepsi made it clear that the middle child was not to her liking. Visions of a bummer came to mind and I quickly ushered him over to Lyric who had also just presented us with a handsome little boy. She thought this other one was fine and she liked him (had previously tried to snitch him actually) and then he nursed a bit and ..she gave him back. Ah HAH! I felt his teeth and discovered some sharp little points. The DH was enlisted to hold the young man for his first dental appointment. An emery board rounded the little daggers and his mouth was declared 'comfortable'. Pepsi however was not willing to take our word for it and had to be restrained and comforted by DH while we proved that he had been to the shop and came back better for it. From experience I knew this procedure had to be done on both sides so the little man got a full tummy and was ready for a nap. I tucked him in next to his brothers and gave Pepsi some nice soothing alfalfa to calm her. An hour or so later the boys woke up hungry and ran to the snack bar. I held my breath. Pepsi nuzzled each little tush without exception. Whew! It worked again. I often wonder at this time of year how many rejected lambs are due to snaggleteeth? It's late and so I'll close for the night but I know many of you were wondering how many lambs were in there! The petite pois weighed in at 7#, 6# and 5.5#. Yup 18.5 pounds of babies she had been carting around! No wonder she was hungry enough to snarf up an egg! Congrats...and thank you for sharing your story. I'll be sure to know to check for sharp teeth now. Hey, great job - I'd have never thought about the teeth! They are cute little fellas. T.
Hey Marybeth...we need an update!